The WPF pivot grid control organizes and summarizes business data and displays the result in a cross-table format. Asynchronous loading - Ability to perform long-running operations asynchronously on a background thread. This allows end users to access other UI controls without distraction. On-demand loading - The control can load a large set of records on demand in little time. Virtual scrolling - It means a value only updates in the respective pivot grid view when the end user releases the scroll thumb. The WPF Pivot Grid control simulates the pivot table feature of Excel. The data source for the control should be either a DataTable, DataView, DataSet from SQL databases or collections like IEnumerable, ICollection, IList, List and ArrayList. The pivot table field list and group fields are automatically populated with fields from the bound data source. They later allow end users to drag fields, filter and sort them, and create a pivot report at runtime. Editing - Edit values at runtime, thereby updating the total cell simultaneously. Updating - Update values in real time by pushing the live data and refreshing the control whenever it’s required. Built-in header and Excel-like filter UIs with advanced filtering options to easily filter and view data. It is also possible to filter programmatically. It is also possible to filter programmatically. Header filtering - Display only selective values for a field through either UI or code-behind. Excel-like filtering - Advanced options are available to filter column and row headers either based on label text or grand-total value. Order rows and columns, either based on labels or values. Header sorting - Order the column and row header text either in ascending or descending order. Custom sorting - Order the column and row header text based on the custom comparer defined by user. Column sorting - Order the column values either in ascending or descending order by clicking the desired column header. Multi-column sorting - Order one or more columns either in ascending or descending order by holding the Ctrl key and clicking the column headers. Summaries - Provides extensive support for you to define your own custom summaries for the pivot item values using a built-in dialog at runtime as well as programmatically. It also supports 19 other built-in summary types to customize the summaries. Calculations - Along with 16 built-in calculation types, there is also extensive support to insert user-defined calculated fields using a custom formula, either dynamically at runtime or programmatically. Expression field generates data by executing user-defined expressions. The generated data is specific to a few field(s) from the underlying data source. It easily obtains a list of raw items for a particular value cell or summary cell. Format the column header, row header, summary cell, and value cell of the control. Define conditions that, when met, format values and summary cells font, color, and border settings. Users can visualize the control either as a flat grid or a pivot table similar to Excel. Users can also position summaries at the top. Normal layout - This looks like the pivot table in earlier Excel versions, allowing the end user to pivot rows, columns, and calculations. Flat grid - Users can customize the pivot grid to look like a flat grid. It allows users to pivot only rows and calculations. Summary layout - The summary layout easily switches the summary position to either the top or bottom beside each field in the control. Subtotals and grand totals are calculated automatically by the pivot engine inside the control and displayed in the pivot grid. This helps users make decision based on the totals. 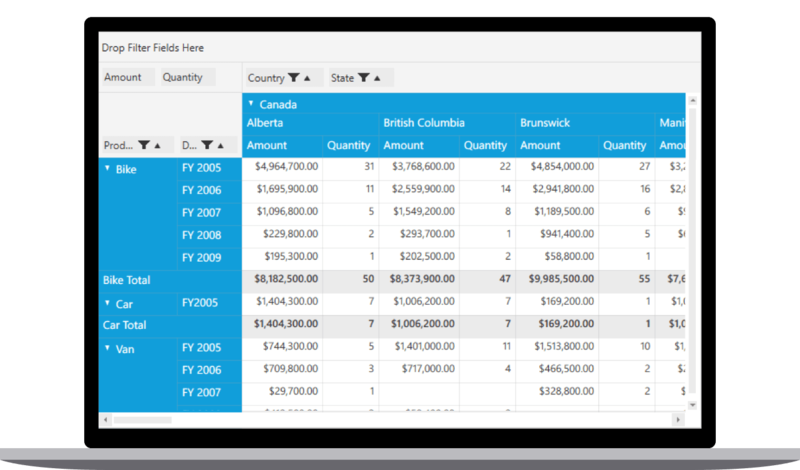 Also, users can show or hide subtotals and grand totals for rows and columns. Hyperlink - User can retrieve information about a particular cell on hyperlink cell click. It later allows you to perform custom operations programmatically. Context menu - There is a UI option to expand or collapse a header to a certain extent. Tooltip - Provides basic information about a cell while hovering the mouse pointer over it. Column resizing - Easily resize each column’s width through a simple drag operation at runtime. Freeze header - Users can freeze row and column headers while performing scroll operations to have a precise view of the content. Selection - Select a range of value cells. Settings in the WPF Pivot Grid control can be serialized to an XML format and loaded back through the built-in deserialization options. The WPF Pivot Grid control has a rich set of options available for exporting data to Excel, Word, PDF, and CSV, and printing the same. Several options are also provided to customize the exporting and printing operations. Today we provide 1000+ controls and frameworks for web (ASP.NET Core, ASP.NET MVC, ASP.NET WebForms, wpf, Angular, React or Vue), mobile (Xamarin, UWP and wpf), and desktop development ( WinForms, WPF & UWP). We provide ready-to deploy enterprise software for dashboards, reports, data integration, and big data processing. Many customers have saved millions in licensing fees by deploying our software.